The Henry Kuns Award is named after the founder of David & Margaret Youth and Family Services. We felt it fitting to honor his legacy by celebrating the accomplishments of foster youth. The Henry Kuns Award recognizes a youth aging out of foster care for their accomplishments on the path to independent living. 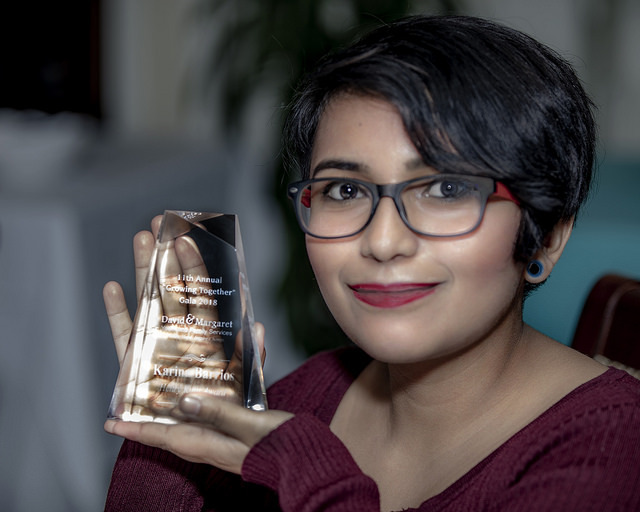 This is the inaugural year of the Henry Kuns Award, and we are thrilled that Karina Barrios is the first recipient. 20-year-old Karina hails from the San Fernando Valley. She entered a group home for foster children in Pasadena at age 16, when her parents separated. Upon “aging out” of the home - “I left on a good note,” she says with a smile – her social worker told her about the Transitional Housing Programs at David & Margaret Youth and Family Services, where she was accepted into the program and lives in an off-campus apartment with her son, Emilio (who is almost 2 years old). Once Karina settled in to her apartment she availed herself of all David & Margaret's Youth Workforce Training Program (YWTP) offers. She worked with the employment coach, took advantage of the paid internship program, and many of the workshops. After succesfufly competing her paid internships at The Store @ David & Margaret as well as Dave & Maggie's Cafe Karina now works part time at Dave & Maggie’s Café and attends Adult and Career Education in Pomona, working on her high school diploma with an eye toward a career as a therapist in a group home setting. Karina balances all of this while also parenting her almost two year old son Emilio. Karina and her son are set to move into an apartment at Cedar Springs next month. Cedar Springs is a permanent supportive housing complex that David & Margaret recently completed. Cedar Springs will offer Karina, and the others who live there, a beautiful new apartment with supportive services for as long as they need. Karina has always strived to lift others up while she endeavored to propel herself forward. Program Manager Marissa Scholefield says of Karina "Her goal from the beginning was to always give back. She has never expected anything, but rather worked hard to earn everything she had." Karina has the determination and commitment to make her dreams of being a therapist come true. All of us at David & Margaret are so proud of her and honored to provide her the resources to support her on her journey and help make her fairytale come true!